Critical periods have been identified for the development of the hearing and vestibular system. The human inner ear develops during week four of embryonic development from the auditory placode, a thickening of the ectoderm that gives rise to the bipolar neurons of the cochlear and vestibular ganglions. The auditory vesicle gives rise to the utricular and saccular components of the membranous labyrinth. Beginning in the fifth week of development, the auditory vesicle also gives rise to the cochlear duct, which contains the spiral organ of Corti and the endolymph that accumulates in the membranous labyrinth. In our vestibular system, neurons are undeveloped at neuronal birth and mature during the critical period of the first two to three postnatal weeks. Many studies have supported a correlation between the type of auditory stimuli present in the early postnatal environment and the topographical and structural development of the auditory system. inner ear: The portion of the ear located within the temporal bone that includes the semicircular canals, vestibule, and cochlea. It is responsible for hearing and balance. vestibular system: The sensory system that provides the leading contribution about movement and sense of balance in most mammals. The human inner ear develops during week four of embryonic development from the auditory placode, a thickening of the ectoderm that gives rise to the bipolar neurons of the cochlear and vestibular ganglions. As the auditory placode invaginates towards the embryonic mesoderm, it forms the auditory vesicle or otocysts. Formation of the Mammalian Ear: The cochlea and vestibule viewed from above. The auditory vesicle gives rise to the utricular and saccular components of the membranous labyrinth. They contain the sensory hair cells and otoliths of the macula of utricle and of the saccule, respectively, which respond to linear acceleration and the force of gravity. The utricular division of the auditory vesicle also responds to angular acceleration, as do the endolymphatic sac and duct that connect the saccule and utricle. Beginning in the fifth week of development, the auditory vesicle also gives rise to the cochlear duct, which contains the spiral organ of Corti and the endolymph that accumulates in the membranous labyrinth. 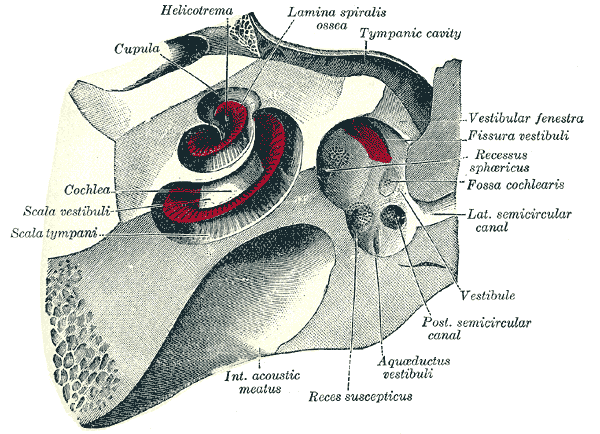 The vestibular wall will separate the cochlear duct from the perilymphatic scala vestibuli, a cavity inside the cochlea. The basilar membrane separates the cochlear duct from the scala tympani, a cavity within the cochlear labyrinth. The lateral wall of the cochlear duct is formed by the spiral ligament and the stria vascularis, which produces the endolymph. The hair cells develop from the lateral and medial ridges of the cochlear duct, which together with the tectorial membrane make up the organ of Corti. Critical periods have been identified for the development of hearing and the vestibular system. In our vestibular system, neurons are undeveloped at neuronal birth and mature during the critical period of the first two to three postnatal weeks. Disruption of maturation during this period can cause changes in normal balance and movement through space. Animals with abnormal vestibular development tend to have irregular motor skills. Studies have consistently shown that animals with genetic vestibular deficiencies during this critical period have altered vestibular phenotypes, most likely as a result of lack insufficient input from the semicircular canals and dopaminergic abnormalities. Moreover, exposure to abnormal vestibular stimuli during the critical period is associated with irregular motor development. Many studies have supported a correlation between the type of auditory stimuli present in the early postnatal environment and the topographical and structural development of the auditory system. First reports on critical periods came from studies of deaf children and animals that received a cochlear implant to restore hearing. Approximately at the same time, other studies demonstrated that the adaptation to the cochlear implant is subject to an early developmental critical (sensitive) period. These corresponding data demonstrated both on children and in animals that this sensitive period has consequences for medical therapy of hearing loss.